My son and I came around a bend in a logging road and saw a large bobcat on a deer in the edge of the snowy road ahead. The cat ran into the timber. We watched for 20 minutes and then called with no luck. Photo above is as it lay. The bobcat had eaten a few bites from the under side of the lower leg and finished cutting off a broken hind leg when we arrived. Tracks in the snow told the story. The bobcat had jumped the blacktail button buck and rode it till it went down and slid across the slightly sloping road. The buck got up and jumped back onto the slick ice center of the road where it apparently did the splits and broke its hind leg. It made another jump and went down for good, sliding to the edge of the road. From the mussed hair on the throat the cat apparently killed the deer by choking it, and that fits with photos we've seen of bobcats killing deer. That was on Tuesday. On Friday we came back and the cat had dragged the deer into hiding behind the screen of brush along the road and had eaten all of the hindquarters. Below shows the buck on Friday that we dragged back to its original position on the edge of the road. Last edited by Okanagan; 02/09/19. I have never heard of a bobcat killing a deer here, although I'm sure they do take fawns. The biggest bobcat I've ever killed here weighed just under 25 pounds. I have only seen one that I believe would weighed more. I'm sure that they are capable of taking down a smallish deer, but I'd think it would take a really big bobcat to do so. That must have been a large cat. Last edited by JamesJr; 02/10/19. That's a big cat Rio. What did it weigh? I've actually killed coyotes that were carrying a fawn that just been killed. But, in all my years out and about here on my place, and others where I hunt, I have never seen a documented case of a coyote, or bobcat, killing a deer, other than a fawn. I know it happens, but it's just something that I've never seen. Not mine but a friend sent me these taken on the Lamoil Grade in No. NV. Cool stuff. Thanks for posting pics. 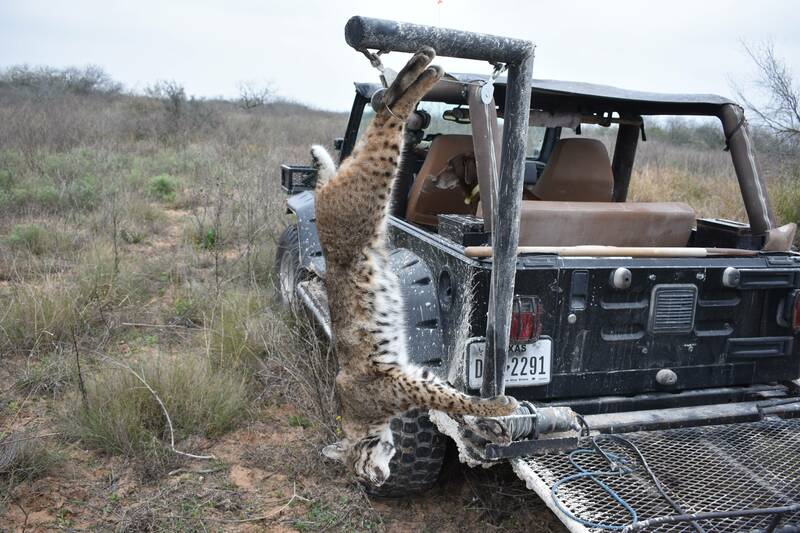 We caught a December bobcat one time that had just killed a young whitetail deer, probably about the same size as the one you found killed. It would be interesting to set up a trail cam over a fresh kill like the one you found. Not mine but a friend sent me these taken on the Lamoil Grade in No. 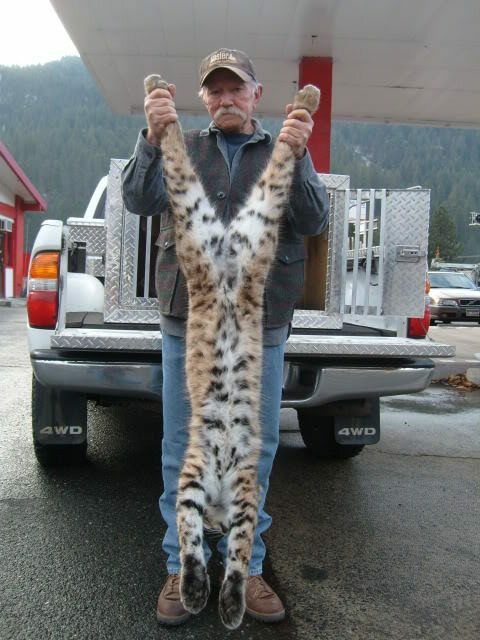 NV.Ain't that a lynx that has ahold of the deer? Ain't that a lynx that has ahold of the deer? Last edited by JimH; 02/10/19. Bobcats kill a lot of deer in this area, way more than we used to think. This is the second time in a few years that we have come on a fresh kill in the road with the bobcat still on it. They are persistent and come back soon after a man leaves. We've found several other kills that were almost certainly bobcats, all in winter, and the two fresh kills were both YOY button bucks. 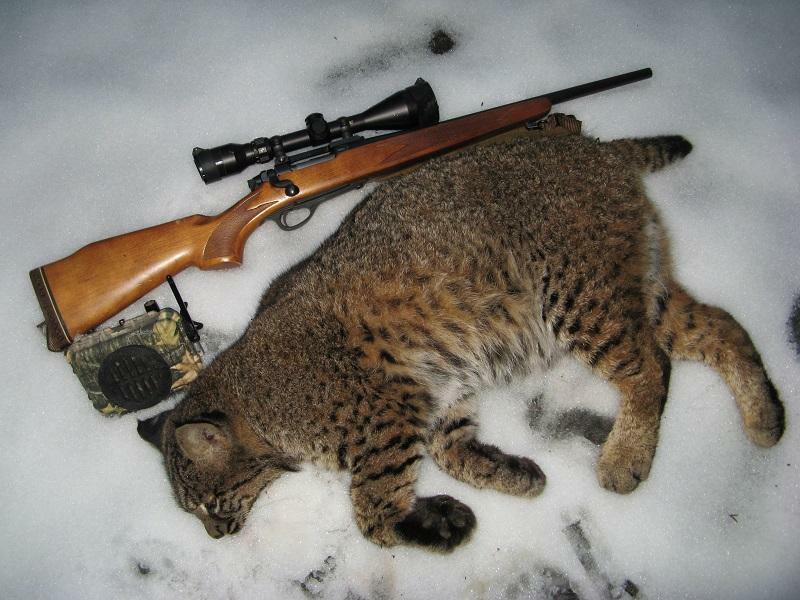 Bobcats are not hunted much in this area of the NW. I haven't killed nearly as many as other campfire members but have three that weighed over 30 pounds. Maybe with little hunting, more of them grow into mature old toms more likely to kill deer. My biggest one weighed 34 lbs., below. 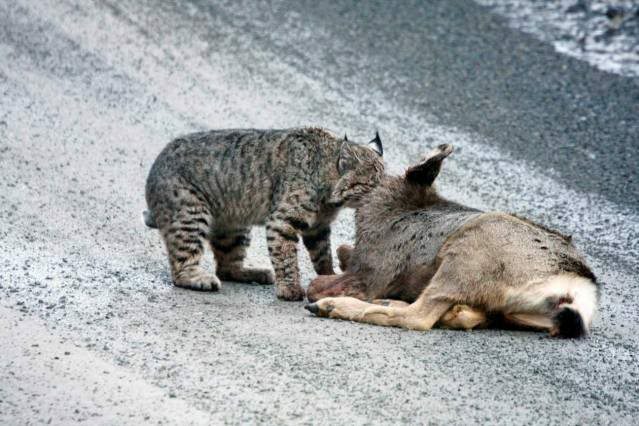 The photos of the bobcat killing a deer are definitely a bobby, not a lynx. 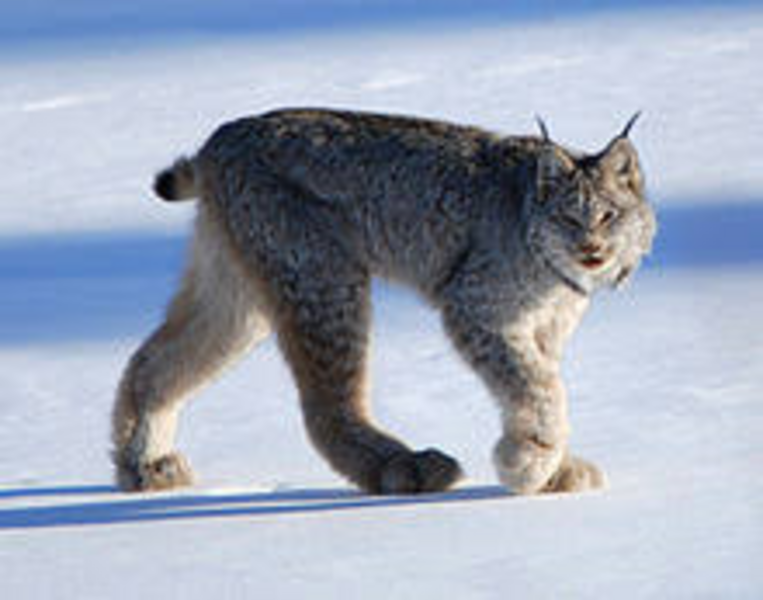 Lynx have HUGE legs way different from a bobcat, plus they have a shorter tail and longer ear tufts though when I have called them I would not shoot based on ear tufts alone but wanted to see legs before shooting. lynx pic below. FieldGrade, that is a HUGE bobcat! With the back leg detached from the hind quarter. My guess would be it had been shot or struck by a vehicle and broke the leg. And the Cat came on it. Dispatched it and started feeding on the hind quarter and chewed the leg off. I came a bobcat killed deer years a go. That one had a clear bite mark right behind but close to the ear. They kill more deer then most people think. It is possible that the deer broke its leg in some natural accident before the bobcat came on it, unlikely but possible. The break is not likely the result of bullet, vehicle or other human cause. I will leave the reply which I wrote earlier. Guess away. I am surprised that the second guessing has not started till now. The bobcat we saw on it killed this apparently healthy wild country buck. No doubt. Anyone may believe what they want. No other vehicle drove up that road that day, and probably none the day before. It is not an active logging road and has very little traffic. 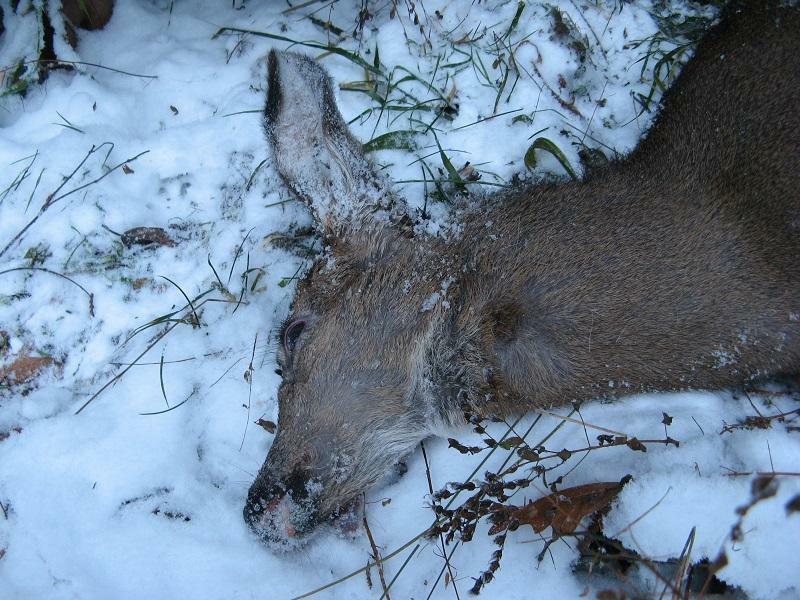 The deer was still warm, the tracks and slide marks and blood spots etc. were fresh, untouched and easy to read overall in a skiff of unbroken snow over old snow. No cougar, human, vehicle, canine or other tracks marked the snow, only the bobcat and deer, whose tracks appeared normal. Blacktails in this region usually live in a small area, especially a young deer like this one, and it is a long ways to humans, dogs or vehicle traffic fast enough to hit a deer. Plenty of lions up there but no sign of cougar here and if a cougar broke the leg, it is hard to imagine the little buck surviving long enough to leave all lion tracks behind. The broken and severed leg are a bit of a puzzle but they are pictured as found. We have watched coyotes chase deer onto lake ice, where they often slip and do the splits on ice, break their pelvis and then are easy prey for the coyotes. This deer appeared to slip on the packed icy snow in the traveled portion of the road. That is where the first spots of blood on snow appeared, and we are guessing that the leg broke at that point somehow. Nothing about the broken leg looked like a bullet wound nor like anything but a fresh clean minutes-old break. The cat ate a little meat right above the break and cut off the leg, leaving it as shown. 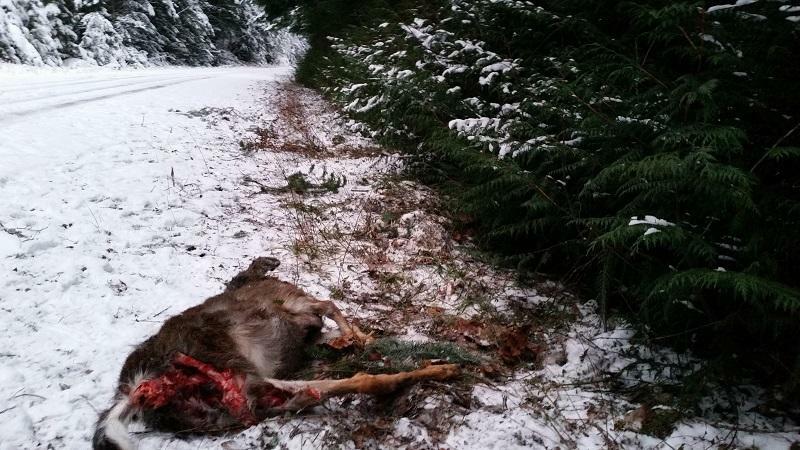 It must have rolled the deer over or something because the only portion eaten is unseen in the photo, under the lower hind leg, just above the severed hock. I think that the cat ate a few bites, then started to drag the deer out of sight when we arrived. Again, my guesses, on the spot. This ain't a freeway and is across a river canyon, a couple of thousand feet higher and 7 or 8 heavily forested steep miles from the nearest house or tiny garden cultivation. Read about some state game agency [NE] doing a study on bobcats killing deer . They did a necropsy [animal autopsy] on deer killed by a bobcat and thoroughly examined the damage inflicted on the deer . They looked for these traits on dead deer they found and kept compiling info. .
Bobcats do what the deer Okanagan & son found - they start fighting to get the bobcat off of them and injure themselves . This study was in a heavily wooded region and deer often had broken necks as the main injury - from running and smashing into trees trying to dislodge the bobcat . #WALK AWAY - say it to liberals . I think that I over reacted to 1lessdog and I apologize for that. Interesting study that ol_mike mentioned. My son and I have been wondering why we find bobcat kills on the road more than we find cougar kills on roads, though we have found both. 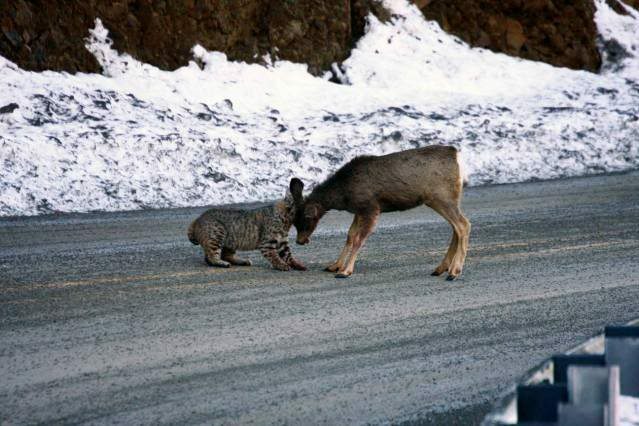 I wonder if a road makes it easier somehow for a bobcat to stalk or kill a deer? The series of photos of the big bobcat killing a deer on the highway are in that category. 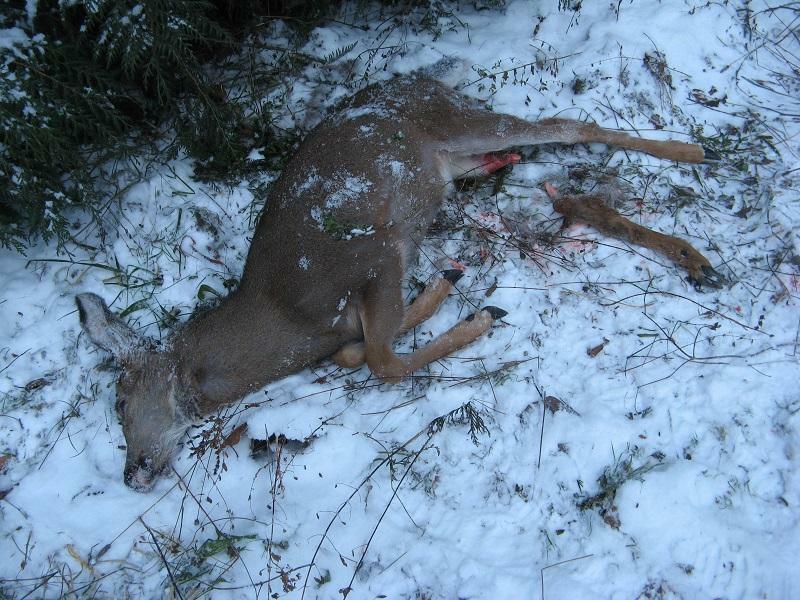 Nothing we've seen makes us think that the kills we have found are a cat killing a deer already injured by a vehicle. All of our finds have been on on seldom traveled old and inactive logging roads that cannot be driven with much speed. I wonder if (in line with ol_mike's study) a bobcat size predator takes less punishment when he jumps a deer in the open than he does if he jumps a deer in timber and it bashes him against trees? I read somewhere that all of the wild cats big and small are capable of hunting animals 6 times their own weight. So, a 20lb cat and a 120lb deer are the upper end of possible. 100lb mountain lion, 600lb elk, etc. Cats are sneaky and take a lot more than people think. The rifle is nearly as exotic as the bobcat. 746 registered members (117LBS, 12344mag, 1234, 10gaugemag, 01Foreman400, 77 invisible), 1,437 guests, and 560 spiders.